In October 1924, after ten years as the leading progressive American weekly, The New Republic magazine filed for bankruptcy. Founded in 1914 under the editorial leadership of Herbert Croly (1869-1930) and Walter Lippmann (1889-1974), the magazine was losing subscribers, Lippmann and other writers were being lured away by other publications, and The New Republic desperately needed a plan. 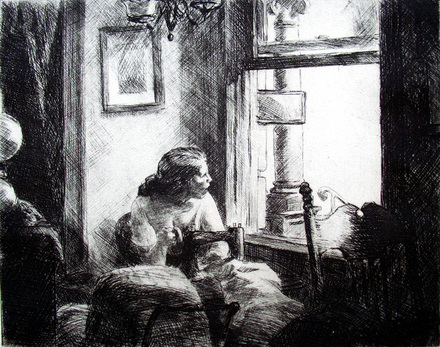 In December of the same year, the magazine ran an advertisement announcing a subscription bargain: if you purchase a two-year subscription to The New Republic, you will also receive a portfolio of six etchings by the American artists Peggy Bacon (1895-1987), Ernest Haskell (1876-1925), Edward Hopper (1882-1967), John Marin (1870-1953), Kenneth Hayes Miller (1876-1952), and John Sloan (1871-1951). The price was $12 (a regular one-year subscription was $5). They had no idea what a bargain this would be. 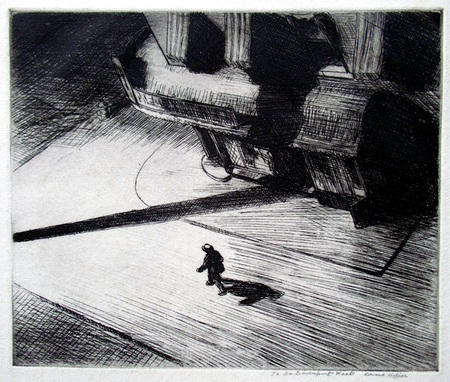 Hopper’s Night Shadows was completed at the beginning of 1921, just in time for the January 25 opening of the Chicago Exhibition of Etchings sponsored by the Chicago Society of Etchers. The drypoint was seen again that year in the National Academy of Design’s winter exhibition and in 1922 at the First International Exhibition of Etchings, organized by the Brooklyn Society of Etchers and held at the Anderson Galleries in New York City. Hopper’s friend, Louis Bouché and manager of the Belmaison Gallery inside the Wanamaker Department Store, chose Night Shadows for a show in May of 1922 and again in May of 1923. It was easily Hopper’s best-known and best-loved print. Surprisingly in 1923, Hopper stopped making prints and when The New Republic asked for a printing plate, he happily offered them one of his best. Most collections hold the 1924 reprinting, but the sheet in Princeton’s Graphic Arts collection is from 1921, printed by Hopper himself. The collection holds one other print by Hopper, seen below.